This week, we’re thrilled to introduce you to a one-of-kind clothing line developed by autism mom Lauren Thierry. These unique shirts improve the quality of life, self-esteem, safety, and independent dressing skills of children and teens with special needs. Inspired by preppy American fashion brands, these stylish shirts come with a discrete GPS tracker embedded in the seam enabling you to locate your child at any time. Each pullover features stretch Lycra panels instead of buttons, zippers or laces, and no scratchy tags at the waist and neck, optimizing the shirt for comfort. Best of all, each shirt is double-faced so it can be worn backwards or inside-out and still be on the “right way”! This week, we’re offering two of Independence Day’s stylish shirts at a 15% discount. We think these shirts offer quite a bit, helping individuals dress themselves appropriately while providing the comfort of knowing that you can locate your child if they should ever wander. We’re also excited to introduce you to Independence Day founder and autism mom, Lauren Thierry. She’s written an excellent article just for us on her experiences with her son, Liam and how she came up with this ingenious idea. We hope you enjoy! So when I figured out a way to “fashionably” GPS-dress Liam, my son with autism, it was pretty much “the mitten thing.” To the tenth power. No longer are moms talking about frozen fingers. They are talking about saving lives. Finding the one who wanders. I took a mainstream rugby shirt and tweaked it just a bit, so that my son with autism could wear it easily, and softly folded a GPS into the fabric. That wasn’t a revolution. It was however, the start of a 14-piece clothing collection for those with disabilities. And it did start a “thought revolution.” That maybe those with cognitive impairments, or physical handicaps, could – and should – get dressed independently and look just like everyone else. And be safe and accounted for. So I cringe when I’m called a “designer.” I’m not even a fashionista. So why would someone like me start a “trendy/preppy” clothing line? Why would I carve out a niche in the preppy apparel space already dominated by Gap, JCrew, Abercrombie, Lacoste, Lilly, and Ralph? Because that’s the stuff I wear, my typical 12-year-old twins wear. But my son with autism – and some 12 million other tweens/teens/young adults – cannot wear. Because tags, buttons, zippers – even collars – make those rugby shirts, cargo pants, and pretty pastel dresses impractical, uncomfortable, inaccessible and sensory-averse to those in that disabilities demographic. Because I’m an autism mom. That makes me a warrior mom. An activist mom. Someone who sees a lot of families, like mine, just trying to get through the day with a kid who can’t dress himself, except in baggy sweats and mono-color T-shirts. Even then, my Liam runs a 50% chance of getting those clothes on backwards. Or inside out. Or some other way that embarrasses his siblings and starts our day off under a cloud. I’m not re-inventing the preppy apparel wheel here. I’ve just made some ingenious (patent pending) tweaks to these classic clothing lines, so that this population can have the opportunity of looking like any other kid going off to Greenwich High School, and the dignity of putting those clothes on independently – without Mom’s help for 30 minutes every morning. I quit my job as a CNN Financial news anchor to take care of my son and advocate for autism causes. I shot a documentary, “Autism Every Day,” which premiered at Sundance. Shooting that doc, I spent 24 hours in the homes of 8 “autism families.” I saw that, like my son, these kids learned by “rote” the fundamentals of dressing. But due to simple design obstacles like “fronts and backs,” there was a wide margin for error. That was my first “focus group” on the dressing issue, all down on film. I shot footage of stressed-out, exhausted parents who’d given up trying to dress their special needs children fashionably, just putting their kids on school buses in pajamas. I shot footage of siblings of these kids, embarrassed to be seen next to their minimally-dressed brother or sister. Their experiences reflected my own. I’ve seen where my son Liam and millions of others with special needs are forced to adapt to a world that is simply not adapting to them, in some of the simplest of ways. Like getting dressed. I’ll leave finding a cure for autism to the scientists. But I can put out a clothing line that’ll get these kids up and into clothes just as beautiful and classic as the major designers…and out the door in 3 minutes. On their own, independently. Mom won’t be here forever, you know. Getting dressed – on trend, and on time – every morning. Now that’s Independence. Lauren Thierry is the founder of Independence Day/ID, a technology and fashion convergence designed to address a myriad of safety and dressing issues for the special needs population. A graduate of Sarah Lawrence College and the Columbia University Graduate School of Journalism, Thierry was a TV Anchor in local, national and business news for more than a decade before she left her job at CNN Financial News to care for her autistic son, Liam. 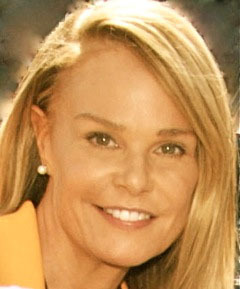 She became a driving force behind numerous autism education initiatives. Among them, she created the fundraiser known as Autism Awareness Day at Shea – then at Citi Field – for which the New York Mets to devote one game a year to autism education. She brought in strategic partners Hess Oil, Prudential Elliman, Bear Stearns, Royal Bank of Scotland, BNY Mellon, and various hedge funds to the effort. Thierry produced the documentary, “Autism Every Day,” described as “The shot heard ‘round the world for autism,” when it debuted at the Sundance Film Festival. Shooting the film, she saw that wandering/elopement were major issues for autism families. She also noted that the simple act of getting dressed for these families was a grueling obstacle course of “fronts and backs,” “insides and outs,” zippers, buttons and tags. That was Thierry’s first “focus group,” all down on film. Independence Day/ID Clothing was started to address those issues. Independence Day/ID is an American Express Passion Project winner for 2013. Written by: Different Roads to Learning on February 25, 2015. This entry was posted in autism, Autism Awareness, autistic spectrum disorder, Guest Blog Post, Products, Sale and tagged ADL's (activities of daily living), autism, autistic spectrum disorder, comfortable clothing for kids with autism, developmental disabilities, family struggles, GPS-enabled clothing, Independence Day Clothing, Lauren Thierry, special needs, wandering by Different Roads to Learning. Bookmark the permalink.